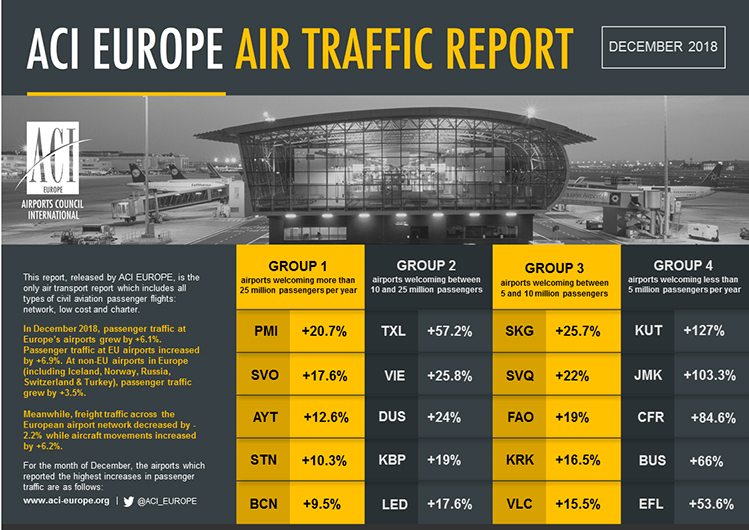 ACI EUROPE has released its traffic report for December, Q4, H2 and Full Year 2018. It is the only air transport report that includes all types of airline passenger flights to, from and within Europe: full service, low cost, charter and others. Passenger traffic across the European airport network grew by +6.1% last year, bringing the total number of passengers using Europe’s airports to a new record of 2.34 billion. While growth somehow moderated in 2018 when compared to the exceptional performance of 2017 (+8.5%), it remained very dynamic – especially considering underlying economic trends and geopolitical tensions. Continued airline capacity expansion played a major role, as aircraft movements grew by +4% – even faster than in 2017 (+3.8%). Passenger traffic at EU airports posted an average increase of +5.4% in 2018 (compared with +7.7% in 2017) – with ATM disruptions, airline strikes and consolidation limiting gains in several markets up to the summer. Since then growth has been on an upward trend, with December closing at nearly +7%. 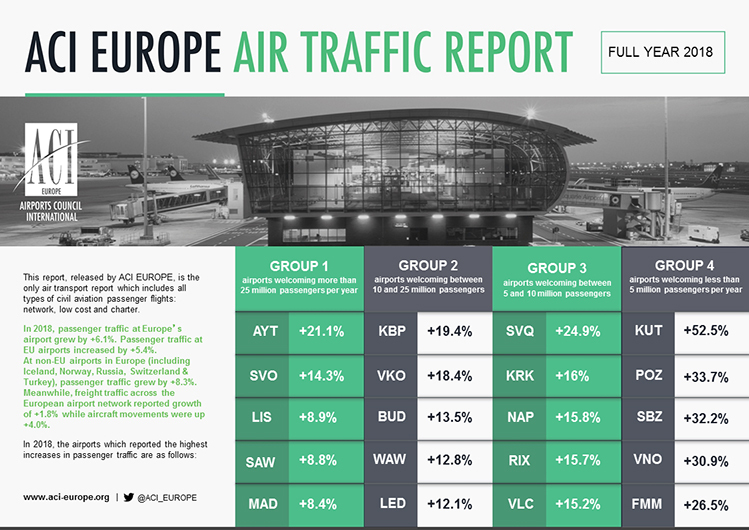 Airports in the Eastern and Southern parts of the EU achieved the best performances, along with those in Austria and Luxembourg. 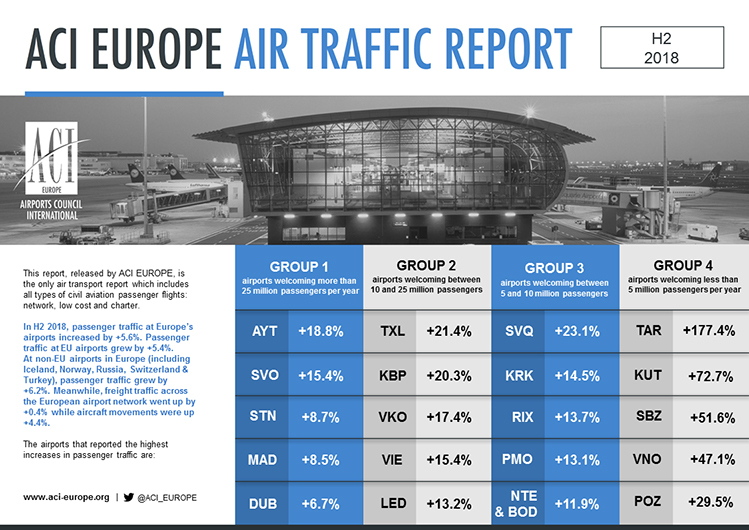 Accordingly, the following capital and primary airports posted double-digit growth: Vilnius (+30.9%), Bratislava (+18.1%), Riga (+15.7%), Budapest (+13.5%), Tallinn (+13.4%), Malta (+13.2%), Warsaw-Chopin (+12.8%), Milan-Malpensa (+11.5%), Luxembourg (+12.2%), Athens (+11.2%), Vienna (+10.8%) and Helsinki (+10.4%). Conversely, the weakest results came from airports in Sweden (where passenger traffic stalled in the wake of the introduction of an aviation tax) and the UK (a reflection of mounting Brexit fears on the economy). The majors (Europe’s top 5 busiest airports) registered +4.8% growth in passenger traffic in 2018, down from +5.5% the preceding year. This lower performance compared to the European average reflected mainly capacity limitations, intensifying hub competition and hub by-pass developments, as well as airline strikes. Still, the majors collectively welcomed 16.5 million additional passengers. Frankfurt achieved the highest growth among the league (+7.8% – fourth position with 69.51 million passengers), on the back of a successful traffic diversification strategy. Istanbul-Atatürk posted the second-best performance (+6.4% – fifth position with 68.19 million passengers) but saw passenger traffic slowing down significantly towards the end of the year (only +1% in Q4). The Turkish hub was followed by Paris-CDG (+4% – second position with 72.22 million passengers), where strikes at the home-based network carrier took their toll. Meanwhile, capacity constraints more than halved growth at Amsterdam-Schiphol (+3.7% compared to +7.7% in 2017 – third position with 71.05 million passengers) and also limited gains at London-Heathrow (+2.7%) which remained the busiest airport in Europe, with 80.12 million passengers. While performances also varied significantly between regional airports, many posted impressive passenger traffic gains in 2018 – a reflection of their agility and success in attracting airlines and developing air connectivity. These included Poznan (+33.7%), Sibiu (+32.2%), Memmingerberg (+26.5%), Seville (+24.9%), Kefallinia (+21.6%), Mikonos (+17.1%), Genoa (+16.7%), Krakow (+16%), Varna (+15.9%), Naples (+15.8%), Linz (+15.7%), Ostend (+15.7%), Valencia (+15.2%), Palermo (+14.8%), Toulon (+13%) and Nantes (+12.6%). However, smaller regional airports (below five million passengers per year) underperformed the European average, growing by +5.1%. Making RFID work – the most effective solution to lost baggage? Tackling runway throughput challenges: SESAR has solutions! Don't miss out on the latest news from ACI EUROPE Airport Business - receive our newsletter straight to your inbox when new content is published. Airport News - Including reports on the latest strategic, operational and political viewpoints from all of the world's Airports, Airlines and Governmental Authorities. Special Editions - Exclusive access to our special reports which detail how airport operators have approached major expansion projects. Conference Updates - Receive all the latest news on conference developments from ACI EUROPE as well as notifications of Early Booking Discount deadlines. Free - All this is completely FREE! Would you like to subscribe to the ACI EUROPE Airport Business newsletter?